Hamburg have sacked coach Christian Titz and replaced him with Hannes Wolf as they seek an immediate return to the Bundesliga. 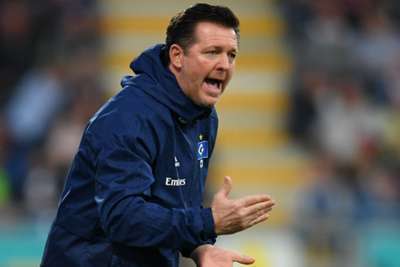 Titz was appointed in March but was unable to steer Hamburg away from being relegated from the top flight for the first time. Hamburg won four of their opening five league matches in the 2. Bundesliga but have since claimed just one victory in five, a run that has featured three 0-0 draws. They are two points off leaders Cologne and a point behind second-placed Greuther Furth and local rivals St. Pauli, who occupy the promotion play-off place. Disappointed with the dip in form, Hamburg have dispensed with Titz's services, turning to Wolf, who won the 2. Bundesliga title with Stuttgart in 2017. Sporting director Ralf Becker said: "Part of our responsibility is to analyse the sporting situation the team is in. "We feel that the team isn't developing enough and we also feel that there was a risk that we wouldn't reach our goals this season." Wolf's first game in charge is at Magdeburg on Friday.